KRK Systems is one of the world's most respected manufacturers of studio reference monitors. In their state of the art design facility, KRK engineers create products that deliver natural and balanced spectral response with low distortion and superior imaging. KRK Studio Monitors have been the professional's choice of recording engineers and artists for mixing and mastering hit records around the globe, as they need to hear every nuance of the audio being reproduced. KRK ROKIT Generation 4 monitors continue in this design philosophy, so regardless of your musical style, genre, or particular mixing needs, KRK Rokits deliver. 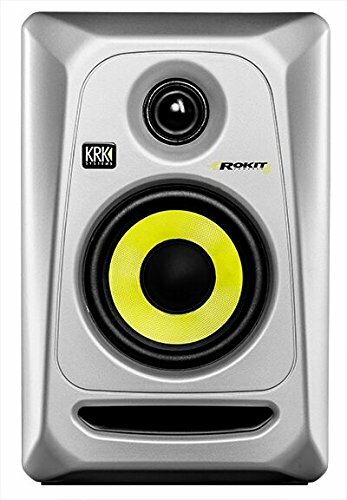 KRK ROKIT 4 G3 powered studio monitors offer professional performance and accuracy for recording, mixing, mastering and playback. The system consists of 1" soft dome tweeter and 4' glass-Aramid composite woofer. It delivers high frequencies up to 35kHz, vocal clarity and extended bass response. The proprietary bi-amped, class A/B amplifier grants SPL up to 106dB. The ROKIT waveguide is designed to ensure detailed imaging in the listening position. The front-firing bass port reduces boundary coupling to allow flexible positioning in the room while the engineered surface reduces diffraction distortion. Multiple input connections ensure the ROKIT 4 G3 will easily integrate in any system configuration. SELENIUM JS12BT Jbl 150W Powered DJ Speaker Bluetooth, 12"